For those of you out there who suffer from chronic minion-ness, do not fear - your WinMin browsers will support this page. 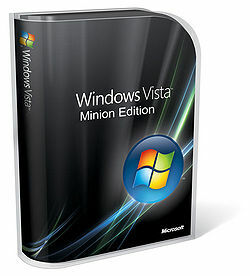 Windows Vista Minion Edition is a new version of Windows Vista. It can simultaneously crash and send complete versions of all your work to various people. Designed specially for minions, when it crashes, the blue-screen of death now no longer comes up. The computer now hums to itself until you admit you are its minion, thus reminding you that you are (or turning you into) a minion. 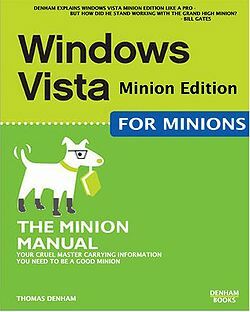 The best way to stop Windows Vista Minion Edition, or WinMin for short, from crashing is to install a new piece of software called the Vista Alternate Glyphic Instant Nuance Anomaliser. This will turn your computer into a sensible computer, but may incur the wrath of the blue screen of death. The original design for WinMin was a simple equation solving machine. WinMin Master popup, describing actions on the minion. The WinMin system also has a setup option for the Minioniser, called MasterMin. This allows the user to send long streams of popups to the minion computers logged to its mainframe. The picture opposite shows a common popup for the MasterMin setup, called the "Error M0N9". It allows the minioniser to kill multiple minions in a matter of moments. Try saying that drunk. The WinMin package is a simple black box, with WinMin logo printed onto it. The interesting part of the design is it will always take exactly three and a half hours to open, at which point it will open violently and shout minion through a series of integrated sound systems and a small minionisation chip. This chip has been known to shout violently at buyers, causing widespread anger and disease amongst many buyers of the item. The original package contained a small heated iron which would then press the word minion into the buyers head as he/she opened the box. This caused havoc with the consumer complaints department who sued Bill Gates for the exact amount of money that they lost in consumer battles - £4.5mill. Bill just gave them the money. It means nothing to him anymore. ~ Bill Gates on Sue me then, b*tches! After firing his consumer complaints department and liquidating their families, Bill went on to redesign the WinMin package. He added in the first speech implant, and rumors have it he still has the prototype. Rumors also have it that Bill has designed a living box which refuses to open without a large amount of persuasion (£100 to be exact). It then taunts the person and their family until shot with a silver memory stick and then rubbed quickly with a strong magnet. Then you must offer the box as a sacrifice to Bill Gates himself, and pray he takes the soul of the box from the house. Ignoring this last step may activate your computer's fail drive. The WinMin software is infamous for coming without an official guidebook. The box rips it to shreds in front of your eyes. So various individuals, such as Thomas Denham, have designed books to guide minions in such a way that they are still minions, but are able to complete their job more efficiently. this book is in fact co-written by the Grand High Minion, but he was not mentioned because...well..he's a minion. And a grand one too. Most manuals refer to the user as minion, for example: "Now, minion, you must prep your drive for usage. Did you get that, minion?". This use of the word minion was for a time thought to be against the minion charter, but was cleared from guilt in 2007 (if any guilt existed). This page was last edited on 4 May 2016, at 04:52.